I used to teach that the Church had to be removed in a pre-trib Rapture so that God could continue His program with Israel in Daniel’s 70th Week, a.k.a. the time of Jacob’s trouble. Must the church be removed before the Lord can fulfill prophecies pertaining to the nation of Israel? No, not at all. The destruction of Jerusalem by the Roman general Titus occurred in 70AD. This was clearly a fulfillment of both Old and New Testament prophecy. In fact, this event was prophesied in the 70 Weeks prophecy of Daniel 9. It was very specific to Israel, and yet it was fulfilled after the death of Christ and after the Spirit was given at Pentecost! In Luke 21: 8-33, the Lord Jesus is teaching his followers (believing Jews) about future things. In this passage, Christ indicates a clear distinction between his disciples (Christians) and Israel, while both are present in the land of Israel at the same time! The unbelieving Jews would suffer greatly. The Lord is very capable of dealing with the nation of Israel while Christians are in the very midst. We know from Eusebius’ Church History that Christian Jews (members of the Church) who were living in the city of Jerusalem in 70AD followed Jesus’ warnings and escaped to the mountains. The entire Jerusalem Church fled when the Romans came. But the unbelieving Jews, who did not believe Jesus or the warnings of the early Christians, stayed within the walls of the city and were destroyed. With such an historical precedent for God’s dealing with the nation of Israel in judgment while the Church remained on earth, it is hard to imagine why the Church must be removed before Daniel’s 70th Week. If the removal of the Church is necessary for the Lord to once again deal with the nation of Israel, then we must conclude that the return to the land, the re-establishment of the nation in 1948, and all the subsequent events among the Jews, have nothing to do with God’s working with Israel on a national basis! 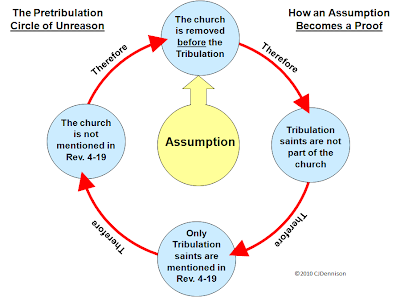 Does the Tribulation Only Involve the Jews? 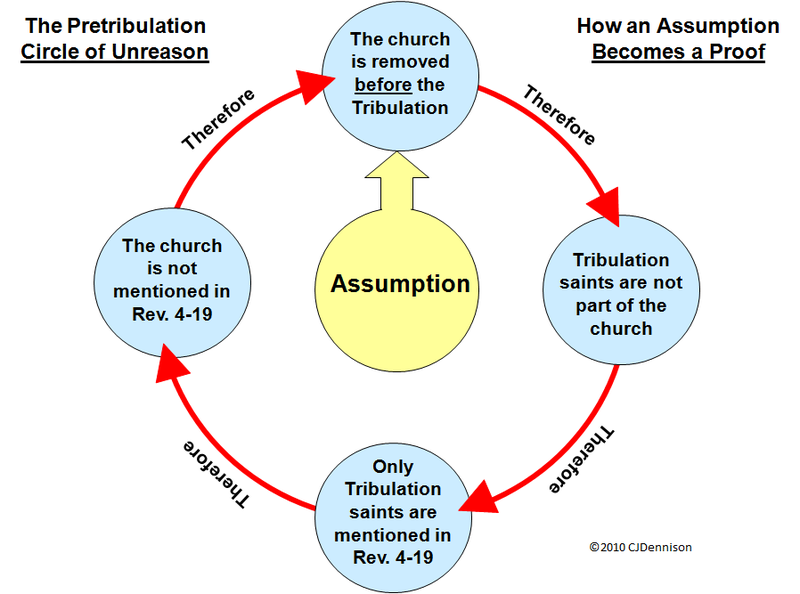 Another argument that is used as proof of a pre-Tribulation Rapture is based upon circular reasoning. First, it is taught that the Church is removed before the Tribulation, thus excluding the Tribulation saints from being part the Church. Then, it is taught that since the Church isn't present, the Tribulation “saints” mentioned between Rev. 4 and 19 must not be the Church. This is a logical fallacy and mishandling of the word of God.